Since my Galaxy s completed its first year last Oct, I thought about trying update my phone my self to the latest GingerBird version rather than going to the Samsung service center. I was able to do the upgrade in few steps, thanks to the blogs. Since some of the online articles warned about a possible ‘Kies’ issue, which said I will not be able to connect through it after upgrade, I thought of alternate backup methods. First of all I backed up my address book, to the SD Card, it can be easily done using the import / export option under your contacts menu. It will save all address, including multiple numbers and details as a single vcf file. I think this way is much better than sync with Goolge account as it Google account does not support multiple numbers if you have any. For Angry birds, I used this utility Angry Birds Backup, so that I don’t need to play all levels again. 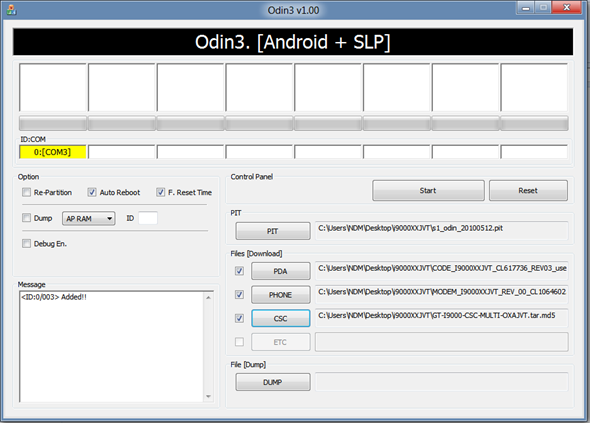 ODIN flash tool for galaxy s.
Launch the Odin flash tool in your PC. Put the handset ON in download mode by- Press and hold Volume down+ OK button and then press the Power button together. After your phone is switched in download mode then connect the phone to PC with the help of USB cable. You can also see a the ID:COM section filled with yellow, that’s the symbol to proceed further and the phone is suitably connected. After that Click on the “Start” button in Odin. This will starts the installation process of firmware. When the installation is finished the phone will reboot and ask you to enter the Google account and select language. Once you finish you can import back the address book, back from SD card. it can be found under Settings > Wireless > Mobile Networks >Access Points. thoroughly enjoying your blog. I too am an aspiring blog writer but I’m still new to the whole thing. Do you have any tips and hints for newbie blog writers? I’d genuinely appreciate it.